I have a confession to make. It took me forty years to experience the exquisite epicurean substance that is SPAM. I realize that in some sectors of the foodie world (aka the high falutin’ snobbery circles of haute cuisine) this might be an advantage. I realize that in other worlds (aka the ultra hip and trendy hot pot universes that Roy Choi dwells within) this might be sacrilege. I also realize that I am really not in either world, but that the main thing that has kept me from trying the famed, square lump of mystery meat has been a traumatic overdosing of other mystery meats in my lifetime. Remember the Vienna sausage? There was actually a time in my single mother, female toddler raising life where those plump little mushy fingers reminiscent of baby hot dogs equaled dinner. And what about devilled ham? That strange pink concoction in a can that was slightly hammy and slightly smoky that made for a filling meal spread lavishly on wheat bread or as a white trash appetizer on enough saltine crackers to sate a young family. We all have our less than savory memories of times in our college years or early twenties where budgets for food were slim enough to justify these strange and unseemly purchases thus my reason for staying away from anything resembling meat in anything resembling a can, even tuna. So imagine my surprise when I started dating the Cute Gardener whose food taste is nearly impeccable (nearly being the key word, just like mine) and opened his cupboards nosily one day to spy a slew of SPAM cans sitting in a neat and orderly row. Imagine my deeper surprise the first time he ever made me his version of fried rice (a hybrid of Asian and Hawaiian) incorporating yummy, crunchy bits of starchiness with fresh green peas and carrots, a buttery dash of soy and the tiniest bits of salty SPAM. I fell in love instantly with the odd culinary delight and have consistently begged him to make me something incorporating its magic ever since. 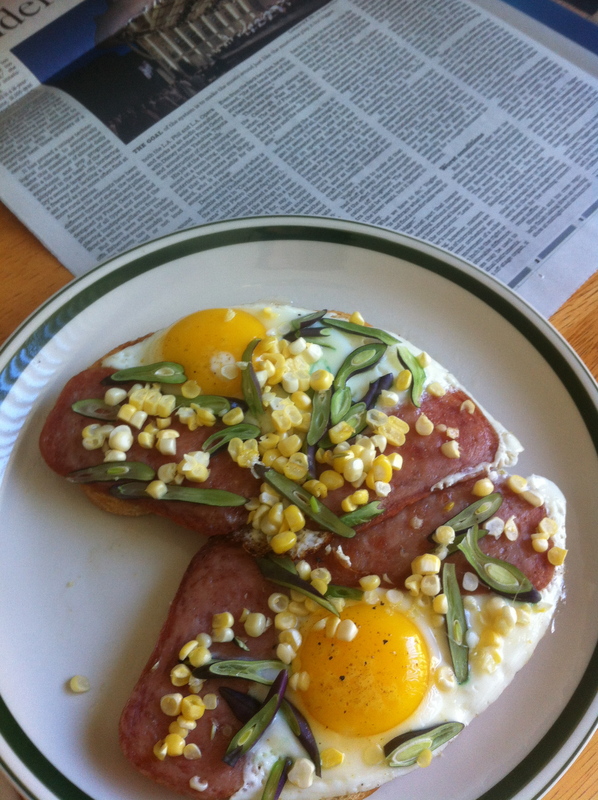 Recently I was delighted by an open-faced egg sandwich on slightly toasted sourdough with the slimmest slices of SPAM, slivers of purple string beans and the last remaining kernels of sweet corn for the summer from our garden. Realizing that I really like this product and wanting to have some justification for it in my non-boxed, bagged, canned or packaged manifesto-wielding food world, I researched what SPAM was made out of and discovered: pork shoulder meat (! one of my favorite things), ham, salt, water, modified potato starch as a binder, sugar, and sodium nitrate (basically a salt) as a preservative. I think I can continue eating the CG’s fabulous concoctions with this product guilt free and with my foodie integrity intact. In moderation of course, like all things pleasurable. This entry was posted in Through The Stomach, Uncategorized and tagged Cute Gardener, foodie dirty little secrets, Kimberly Nichols, Roy Choi, SPAM recipes, Unorthodox Foodie by unorthodoxfoodie. Bookmark the permalink. I am envisioning this blog post as a romance novel titled My Secret Shame… with a bodice-ripping cover illustration featuring you, the CG and a little can of SPAM. My Secret Shame indeed! You’re so brave you’ve admitted you love spam. I hope you don’t get trolled by foodies! We all have culinary quirks, well done for sharing. You’re a trail blazer! What can I say? I have always been a rebel. Thanks for reading! I always think of the SPAM sketch in Monty Python.. “”Lobster Thermidor aux crevettes with a Mornay sauce, garnished with truffle pâté, brandy and a fried egg on top and Spam”! But even though I am a vegetarian, I get it. As a kid, two of my favorite things were Vienna sausages and Deviled Ham! Ha ha, Linnet, you gave me a great laugh for my morning. I love Monty Python! Now I know why my beloved son-in-law likes Spam. Yes I think it is more of an Asian-American and Hawaiian staple. 40 years? That’s a whole lot time between you and Spam. I have that OD relationship with it – it was served a little too much growing up in Montana at my grandparents house. You and CG certainly have fun and eccentric tastebuds!